I know I talk a lot about the Katahdin sheep we have. We really do love the Katahdin hair sheep! Someone asked us not too long ago why we have sheep on the farm. The reason we chose the Katahdin breed was because of several reasons: they do well in the South, they have hair and not wool so you do not shear them, they are excellent mothers and give birth easily (in most cases), they are resistant to many parasites and are relatively care free. Right now, we are keeping all of our ewes and are selling the rams or raising the rams for meat. Sheep are amazingly different compared to goats! They are much easier and less hassle! They also are easier to raise for meat compared to a cow. A cow is much more time intensive and during the winter requires more care and food than the sheep do. 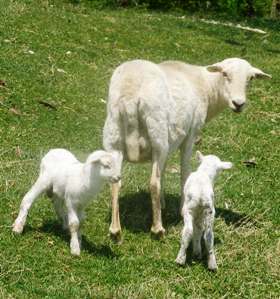 The sheep have been very hearty in feast or famine, flood or drought, bitter cold and extreme heat. No..the baby isn’t dead…he was just born and is resting. This morning, one of the ewe’s had twins. She had one baby ewe and one ram. 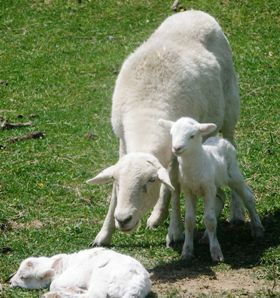 We are thankful that the momma ewe and her babies are thriving and bounding across the field on this fine spring day. Louisiana is one of the original ewes we bought. She had twins last year too. Oh my, the babies are so adorable!